What could be better than playing a fun 9-hole round of golf on a beautiful golf course on a crisp, fall afternoon? How about giving some of Austin’s most economically disadvantaged young children a chance at entering kindergarten equipped to succeed? 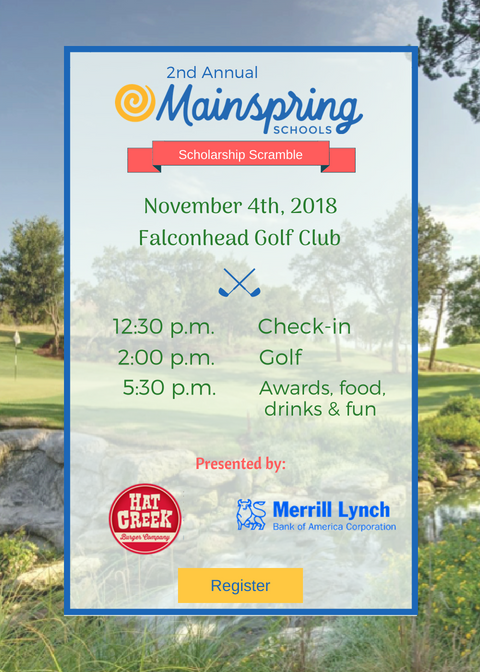 Participating in the 2nd Annual Mainspring Schools Golf Scramble allows you to do both! Register below to join us! All proceeds are tax deductible and go to the Rudi Andrus Scholarship Fund of Mainsprings Schools. Registration and practice: 12:30 p.m. Sponsorship & volunteer opportunities available! Align your organization with a charitable event helping the disadvantaged children of Austin. This social event runs concurrently with the Fall Flowers Workshop + Social — also benefiting the children of Mainspring Schools — at Falconhead Golf Club. Want to include a spouse, family member, friend or colleague? Click here to learn more. Approximately 75% of children attending Mainspring School are from families living below the poverty level and receive tuition assistance from various sources. Without this scholarship fund, families would have to withdraw from Mainspring and likely have no other place to turn for quality preschool education and childcare. Rudi Andrus, Executive Director of Mainspring from 2006-2017 never wanted a child to have to leave the school because of temporary financial difficulties. Because of her kindness, generosity, and dedication to the families of Mainspring, the Rudi Andrus Scholarship Fund was established in her honor upon her retirement. questions regarding the golf scramble? Send us a note.